Our Milwaukee Road U25B #5057 was the focus of a six day work session this month in Portola, CA at the Western Pacific Railroad Museum operated by the Feather River Rail Society. The work was done from Saturday, October 5 through Thursday, October 10, 2013. The focus of the work was getting the mechanical systems of the locomotive ready for it to be moved and also securing the locomotive. The work was led by Wayne Monger, a member of the FRRS Board of Directors and also a Cascade Rail Foundation member who has been a longtime advocate for the 5057. Cascade Rail Foundation volunteers Fred High and William Sery became FRRS members and traveled to Portola from western Washington to participate. They were assisted by additional FRRS members: FRRS Vice President Steve Habeck, David Elems, Kirk Baer, Matt Elems, and Rick Grunninger. 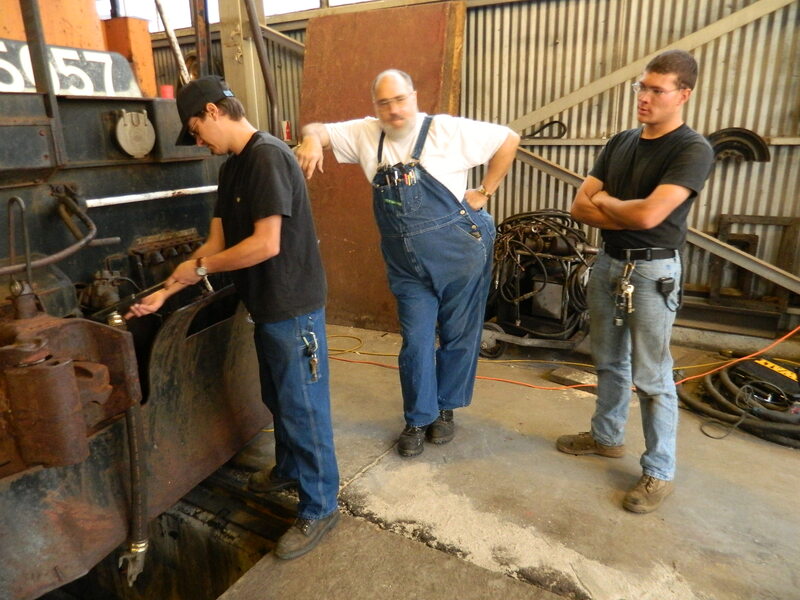 A major focus of the work session was the air brake system. Air brake hoses on the locomotive were replaced and a 26L Quick Release valve was borrowed from Western Pacific U30B #3051 to replace that missing part on the 5057. New main reservoir and signal air lines were installed at both ends of the 5057. Other open ports were plugged with pipe plugs. Much effort was spent addressing the air brake rigging parts missing from the #3 axle. An attempt was made to replace them with EMD parts on hand at the museum, but they did not fit the AAR Type B trucks under the 5057. Parts were borrowed from Kennecott Copper 908, an RS-2 built by ALCO. These parts were similar to those used on the 5057, but not the same. Some of the parts did not fit. Previous repair work done on the fireman’s side of the #3 axle frustrated efforts to install brake rigging components before work wrapped up on October 10. Work was performed on the traction motors also. The lubrication ports on traction motors were cleaned and electrical brushes removed. New crater lube was added to gear cases and bearing oil added to the traction motor support bearings. A pilot plate, salvaged for the 5057 from a scrapped Southern Pacific U33C in the Los Angeles area by Norm Holmes nearly 20 years ago, was installed as the required rear pilot plate. New high strength Schedule 8 bolts were purchased and used to attach the pilot plate to the locomotive. 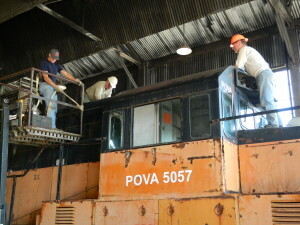 Much of the work to secure the doors and windows on the 5057 was completed. All lower equipment and compartment access doors along the frame and under cab were secured using new fasteners. The loose window frame of the engineer’s front window was secured. New wood blocks were bolted into the sliding window tracks in the cab to keep them in the closed position. 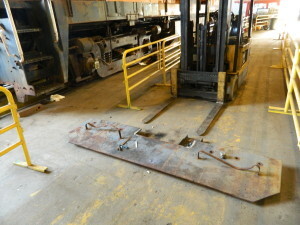 The front cab door handle mechanism was reassembled from parts found in the nose of the 5057 and new, larger door locking hasps were installed on the cab doors. 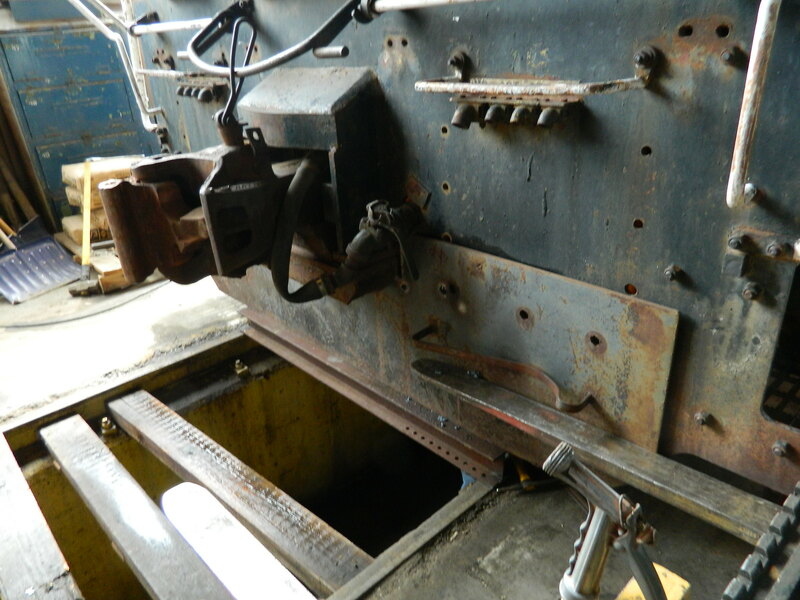 To secure the external hood doors, 1/2″ steel rebar was acquired and cut to fit the locomotive. Rebar was welded on the engineer’s side, but this work was not completed. 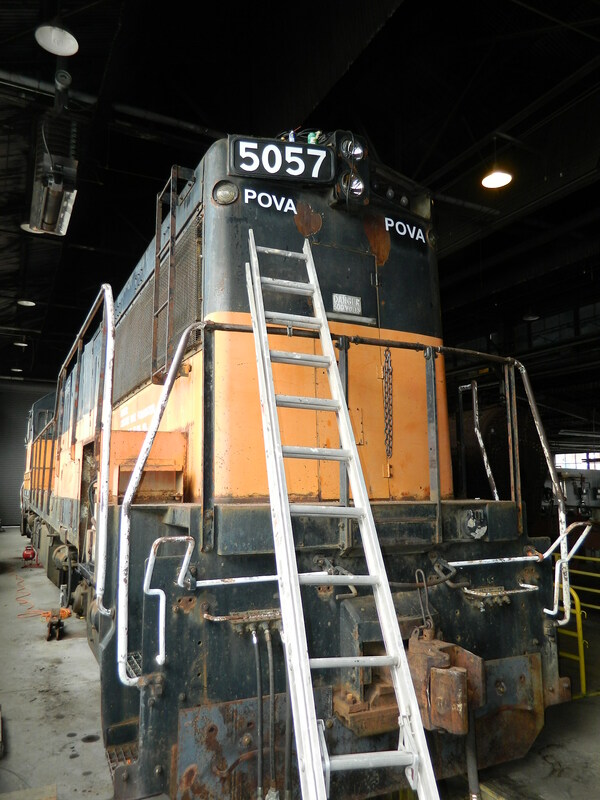 The original “5057″ numberboards were removed for safekeeping and we have them stored in Washington. New reproduction numberboards have been donated by Wayne Monger, but they were not installed. Two additional reproduction numberboards will need to be created because we learned late that the front and back are not the same size. The 5057 will travel back to Washington using Pend Oreille Valley Railroad reporting marks (POVA), so new “POVA 5057″ lettering was added on the cab sides, and “POVA” was added on the hood end corners near the numberboards. 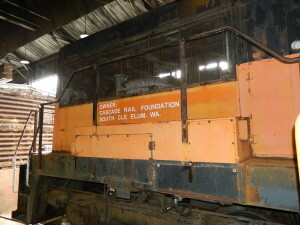 In addition, “Owner: Cascade Rail Foundation, South Cle Elum, WA” lettering was added under the radiator air intake sections. The air horns were removed from the roof for safekeeping also. Reinstallation of air brake rigging parts (hangers, guides, adjusters) needs to be completed on both sides of the #3 axle. The #3 axle also is still missing three out of four brake shoes. 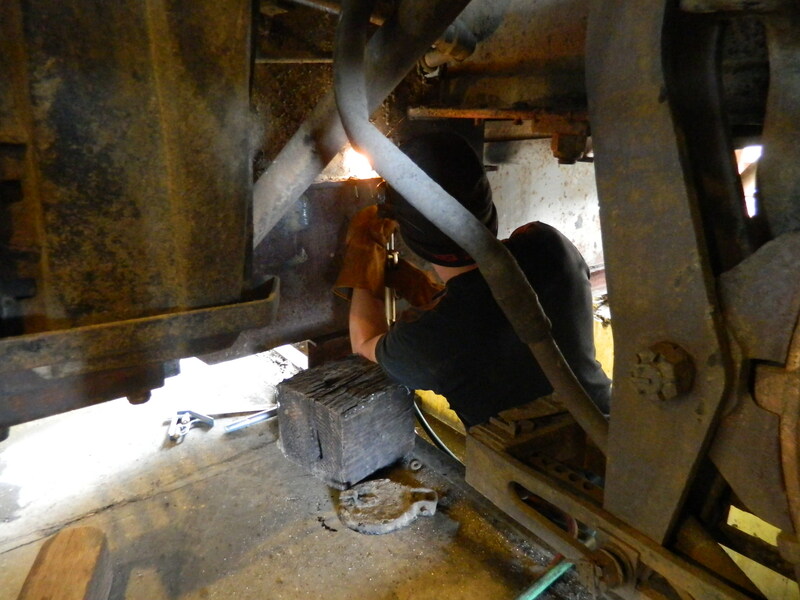 Welding 1/2″ steel rebar at two levels across all exterior engine hood doors. Closing the gap in the handrails at the front of the locomotive (where there is normally a safety chain and drop-step). 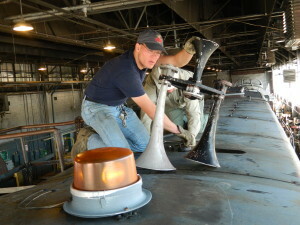 Repainting the safety handrails at all four corners of the locomotive with white enamel paint. 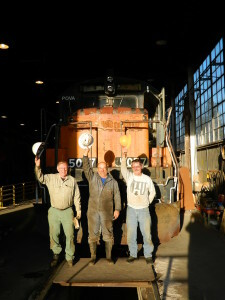 It won’t be possible to get the 5057 back in the shop in 2013, so another work session will need to be scheduled sometime in late March or early April. If all goes well, we should have the 5057 back in Washington shortly afterward. In the meantime, we’ll be making another big fundraising push to ensure we have enough funds to cover the move and also to start the first phase of restoration work, including replacement of the parts borrowed from FRRS locomotives. Cascade Rail Foundation thanks the Feather River Rail Society for their continued cooperation and assistance with this project. Left on our own, we’d be much further from accomplishing our next milestone of getting the 5057 back to Washington. Thank you!